Books by new authors have so consistently disappointed me that I had begun to wonder if it is all in the mind and whether I am unconsciously prejudiced against new authors. 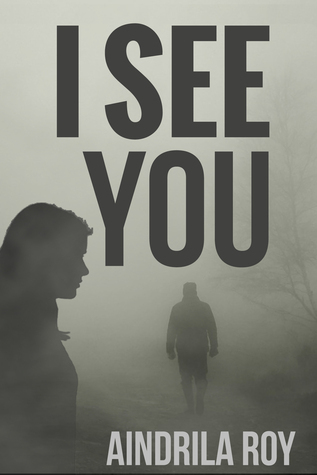 But finally here comes a book that proved that is not the case – ‘I see you’ by Aindrila Roy. I know the author a bit on social media but not exactly a close friend. And I won a copy of the book fair and square in an open contest – so no question of any obligation to the author and in fact, I don’t even owe her a review as such. The book managed to impress me purely by the merit of the writing. It is one of those rare books I finished within half a day. Never felt the need to take a break from the book and the story kept pulling me on and on till the last page. So coming to the story itself, it belongs to horror genre, a genre that I have meticulously avoided. Being of a naturally nervous disposition, I never saw the need to worsen my condition by subjecting myself to horror books or movies. But last year, somehow I ended up reading three books of this genre, one being the horror classic ‘Dracula’. I discovered that while horror of the brutal gory kind manages to gross me out, I seem to be somewhat immune to the subtler kind of horror. In fact I find the subtle horror rather intriguing and read through spell bound more like a dark fantasy. Maybe I should take on Poe and Lovecraft this year. But coming back to Aindrila’s book – it did not quite manage to scare me being of the subtler kind of horror. The story is of Liam, an heir to an affluent business family living with his friends, who starts getting headaches, followed by strange hallucinations. Strange things happen every night and he is not sure if they are happening in reality or they are dreams or hallucinations. Also some strange events occur in the real world such as the strange behavior of his cat and strange parcels containing grotesque gifts. Being a rational, practical man of balanced mind he seeks professional psychiatric help spurning unsolicited offer of help from a weird mystic. I guess this is enough to give a glimpse of the story without stepping into spoiler zone. First of all I must say I liked the narration. It was smooth and polished and made easy reading. The language was good without going overboard. The descriptions were just right neither boring the reader nor leaving everything too sketchy. The dialogues came out quite naturally and the pace was just right. There was never a dull moment and things kept moving. As far as the plot goes, there was no unnecessary attempt to complicate things. A nice simple plot was taken up and executed to perfection with right amount of suspense maintained throughout the story. The characterization was also quite decent and just right with more focus on the one character who mattered and others laid out just to the level required for the story. I did not necessarily go looking for pot holes but nothing really stood out glaringly as such. So I guess the book is well covered on all aspects – plot, narration, dialogue and characterization. In terms of novelty, I would say the story is similar to many others in the genre but had its own unique aspects. It definitely felt fresh and not a rehash of the old tropes. Having said that there was nothing conceptually out of the world as such. But that is me the fantasy buff speaking. After all this is not even fantasy. The other quibble I have is with respect to the ending which for obvious reasons I can’t discuss here. It is more with respect to the kind of story endings I like. Overall I would give an unqualified recommendation for this book. Anyone can pick it up and I can assure you of a couple of hours or three of delightful edge of the seat reading. If I were to be allowed to rip off from that popular line from Jenson and Nicholson, whenever I see horror I think of Stephen King. I know none among the mushrooming desi crowd who can hold my attention beyond a few pages in the genre, but a recommendation from you carries weight. I might be looking out for the title next time cross the aisles of the Crossword. Not sure if it will be available in offline stores, USP. I took a Kindle version. Its not a big house. But she writes pretty decent. Though of course there is nothing much new she can offer for your eclectic tastes. Great review again. I am not one for horror either, but the subtle kind of horror, I could perhaps take a chance on. Yes. It is worth a try. No gross stuff.